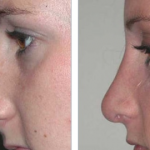 Deviated septum surgery is not recommended for all cases of deviated septum. More than half of all people suffering from deviated septum are asymptomatic and they usually do not know that they are already suffering from deviated septum. 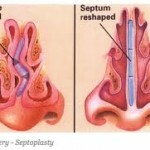 Deviated septum surgery is also called septoplasty will only be needed if the deviated septum causes symptoms, such as difficulty breathing through the nose, recurrent nasal infections, ear infections, headache, nasal tenderness, headache, etc. 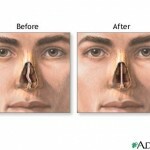 Deviated septum surgery or septoplasty is considered to be a minor type of surgical operation. It does not require strong anesthetics and it does not need to sedate the patient. General anesthesia is commonly used in deviated septum surgery. However, complications can still develop in deviated septum surgery, even though it is a minor type of operation. Since deviated septum surgery involves small incisions within and outside the nose, if care done after the surgery is not right, complications may arise. Complications after deviated septum surgery includes, infections, bleeding, swelling, tenderness, nasal deformity, numbness inside the nostrils and in the front teeth region, nasal tissue adhesion, and many more. However, swelling, tenderness, and numbness are normal a few weeks after the surgery. 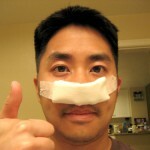 Usually, swelling and pain will totally subside 6 weeks after the deviated septum surgery. For people who engage in regular physical exercise are concerned about exercising after the deviated septum surgery. Exercising immediately after deviated septum surgery is a very big NO. If you will exercise immediately after your surgery, you will just put yourself in danger. Exercising without the go signal from your doctor will just increase the risk of complications, such as bleeding, swelling, and sometimes, going under a surgical operation can happen due to a tear to the incision site. Most of the time, people who underwent deviated septum surgery are allowed to resume exercising four weeks after the deviated septum surgery. If you were not allowed to exercise for about 4 weeks or more, your body can result in some degree of deconditioning. Deconditioning means that your body had a loss of cardiovascular fitness and muscle strength. You can resume your old exercise program, but you have to start slow and build up slowly, for your body to adapt. Starting your exercise slowly and gradually building up is instead of carrying 10 lbs of weights, why not try carrying 5 lbs of weights? And in running, start by running half or less than half the distance and at a slower pace that your usual run?